ABOVE: A TV screen reminds you where you're cruising. INSET BELOW: Fishing huts near Chioggia, a sign in Rome (included in an optional land package), a water-taxi ride in Venice, and colorful houses on the island of Burano. Sunday, Day 1: Board River Countess, tour a crafts workshop on the island of Giudecca unless you'd prefer to relax on the ship or take a stroll, and have dinner on board while the ship cruises from its embarkation pier to the Riva dei Sette Martiri (a waterfront promenade east of the Piazza San Marco). Monday, Day 2: Take a walking tour in Venice, enjoy free time in the afternoon, and visit the Basilica di San Marco for a private after-hours illumination in the evening. Tuesday, Day 3: Set sail for Chioggia (a small fishing city at the southern end of the Venetian Lagoon), with an afternoon trip to the city of Padua followed by a cruise up the Po River to the small port of Polesella. Wednesday, Day 4: Take an all-day bus excursion to Bologna, with a walking tour and pasta-making workshop, or a half-day bus excursion to Ferrara. Thursday, Day 5: Go by bus to Ravenna (a city famous for its Byzantine mosaics). Alternatively, you can stay aboard for a cruise back down the river to Taglio di Po and go ashore for a seafood lunch while the ship returns to Chioggia. Later in the afternoon, both groups rejoin the ship in Chioggia for an evening cruise to Venice. Friday, Day 6: Take an all-day bus excursion to Verona, with visits to Juliet's house (from Romeo and Juliet) and the Roman Arena. Saturday, Day 7: Tour Venice's Rialto food markets, or--if you prefer--go by boat to the crafts workshop on Giudecca if you missed that tour on Day 1. In the afternoon, the ship will sail in the northern reaches of the Venetian Lagoon. Please see our River Countess itinerary map for an aerial view of the places that you'll visit during a typical cruise. 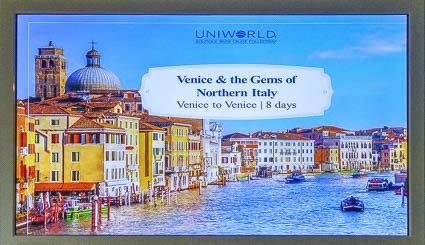 Uniworld also offers a 13-day guided cruise tour called "Splendors of Northern Italy, Venice, Florence, & Rome" that includes the cruise plus two nights in Florence and three nights in Rome. Transportation from Venice to Florence, Florence to Rome, and Rome to Fiumicino Airport is by motorcoach. Water levels on the Po River can be unpredictable, and so can weather on the Adriatic Sea (which the ship has to navigate for a short distance, without passengers, to reach the Po River from the Venetian Lagoon). Occasionally, the itinerary has to be adjusted slightly. During our cruise, the ship was unable to reach the Po because of dangerous weather outside the Lagoon, so we used Chioggia as a base for excursions to Bologna and Ravenna. To complicate matters further, seasonal acqua alta or tidal flooding made it necessary to juggle the schedule slightly in Venice--e.g., by visiting St. Mark's Cathedral for an after-hours illumination on Friday instead of Monday.